Sunflower (Helianthus annuus) is an annual plant native to the Americas that possess a large inflorescence (flowering head). The sunflower got its name from its huge fiery blooms, whose shape and image is often used to depict the sun. The sunflower has a rough, hairy stem, broad, coarsely toothed, rough leaves and circular heads of flowers. The heads consist of 1,000-2,000 individual flowers joined together by a receptacle base. Sunflower seeds were taken to Europe in the 16th century where, along with sunflower oil, they became a wide-spread cooking ingredient. 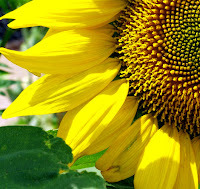 Sunflower leaves can be used as a cattle food, while the stems contain a fibre which may be used in paper production. The sunflower is native to Central America. The evidence thus far is that it was first domesticated in Mesoamerica, present day Mexico, by at least 2600 BC. It may have been domesticated a second time in the middle Mississippi Valley, or been introduced there from Mexico at an early date, as maize was. The earliest known examples of a fully domesticated sunflower north of Mexico have been found in Tennessee and date to around 2300 BC. 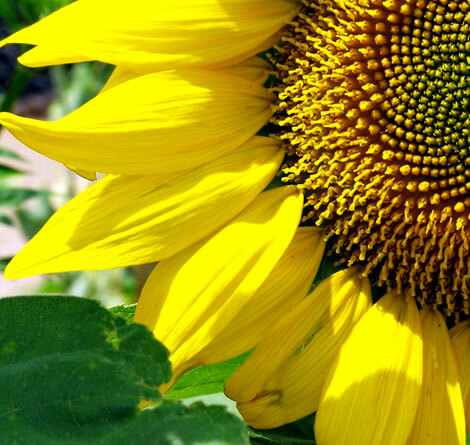 Many indigenous American peoples used the sunflower as the symbol of their solar deity, including the Aztecs and the Otomi of Mexico and the Incas in South America. Francisco Pizarro was the first European to encounter the sunflower in Tahuantinsuyo, Peru. Gold images of the flower, as well as seeds, were taken back to Spain early in the 16th century. Some researchers argue that the Spaniards tried to suppress cultivation of the sunflower because of its association with solar religion and warfare. During the 18th century, the use of sunflower oil became very popular in Europe, particularly with members of the Russian Orthodox Church because sunflower oil was one of the few oils that was not prohibited during Lent, according to some fasting traditions. 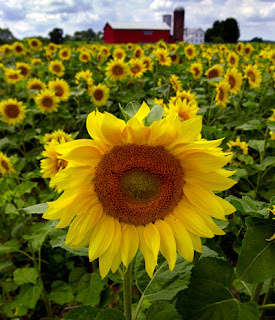 Despite the common belief, mature sunflowers do not track the sun. 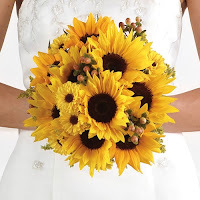 The mature flowerheads typically face east; only young sunflowers exhibit heliotropism (sun turning): the leaves and buds of young sunflowers follow the sun so that their orientation changes from east to west during the course of a day. The movements become a circadian response and when plants are rotated 180 degrees, the old response pattern is still followed for a few days, with leaf orientation changing from west to east instead. The leaf and flowerhead bud phototropism occurs while the leaf petioles and stems are still actively growing, but once mature, the movements stop. These movements involve the petioles bending or twisting during the day then unbending or untwisting at night. To grow best, sunflowers need full sun. They grow best in fertile, moist, well-drained soil with a lot of mulch. In commercial planting, seeds are planted 45 cm (1.5 ft) apart and 2.5 cm (1 in) deep. 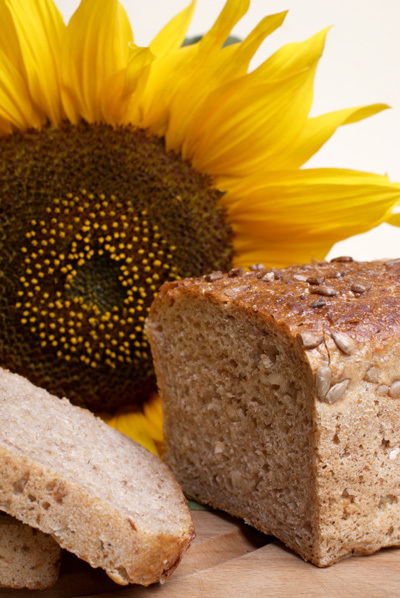 Sunflower "whole seed" (fruit) are sold as a snack food, after roasting in ovens, with or without salt added. Sunflowers can be processed into a peanut butter alternative, sunbutter. In Germany, it is mixed together with rye flour to make Sonnenblumenkernbrot (literally: sunflower whole seed bread), which is quite popular in German-speaking Europe. It is also sold as food for birds and can be used directly in cooking and salads. American Indians had multiple uses for sunflowers in the past,such as in bread, medical ointments, dyes and body paints. The cake remaining after the seeds have been processed for oil is used as a livestock feed. Some recently developed cultivars have drooping heads. These cultivars are less attractive to gardeners growing the flowers as ornamental plants, but appeal to farmers, because they reduce bird damage and losses from some plant diseases. Sunflowers also produce latex and are the subject of experiments to improve their suitability as an alternative crop for producing hypoallergenic rubber.